Arugula is always my favorite salad. This combination of arugula, walnuts and pear is inspired by my visit to the Italian restaurant Pizzeria Libretto last week. I have done a brief review on the dishes I had at the end of this post. This salad gives me some motivations to eat more vegetables. You will have to pre-make the toasted walnuts though. I used halved walnuts pieces and toasted them with maple syrup. Recipes and directions of making toasted walnuts are provided at the second half of the post. I made 250g of walnuts all at once and so I can keep them in an airtight container for a week. I believe I will eat this salad everyday in the coming week. Yay! I am so excited! 1) In the salad bowl, whisk together the vinegar, olive oil and shallots. 3) Toss the arugula with the vinaigrette. 4) Top the salad with pear and toasted walnut pieces. How to make maple syrup roasted walnuts? 2) Mix the maple syrup, EVOO, salt and cayenne pepper in a big bowl. 3) Add the walnuts in the bowl and toss until they are evenly coated. 4) Bake in the oven (pan lined with parchment paper) for 12- 15 minutes, until golden brown. 5) Allow the nuts to cool down on the pan before storing in the container. Moving to Toronto just from two weeks ago, I have already been to Pizzeria Libretto twice, once for lunch, once for dinner. I went to the one on Ossington street. They do not take reservation and they become really busy starting from 6.30 pm on weekday. Lunch time is very busy as well. I have tried a couple of things there, but I would say the pizzas are the most impressive. Next time I will go only for the pizzas. 1) Bread basket, with olive oil and balsamic: good and moist bread, I couldn't stop eating them even after the appetizers came. 2) Friend calamari (appetizer): Not bad. The sauce is little bit spicy and tasty. 3) Arugula salad (appetizer): Best appetizer of the night. We wanted to encore this dish. That's why I have to make it myself! 4) Potato and ricotta gnocchi, oxtail, grana padano: Gnocchi was too light. I prefer richer gnocchi with white creamy sauce. Oxtail did not taste like beef. I thought it was tuna. Disappointing. 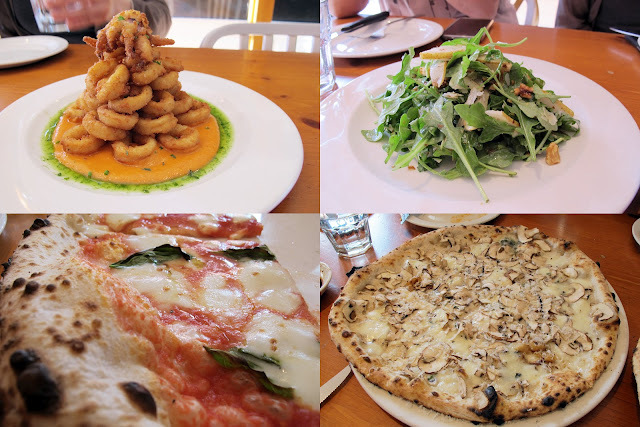 5) Pizza: I tried the Margherita, Ontario Prosciutto, and Cremini mushroom. Delicious! Love to eat the red pizza with their chilly oil! Thin crust and light! awesome!! My favourite is Cremini mushroom pizza. Must eat.